Chef Mario Batali – who currently owns 26 restaurants and employs 4500 people – says in the beginning, he didn’t want more than a single restaurant. Larry King: You visit all your restaurants all the time? Mario Batali: All the time. Larry King: Usually you have to be hands-on, how can you be hands-on? 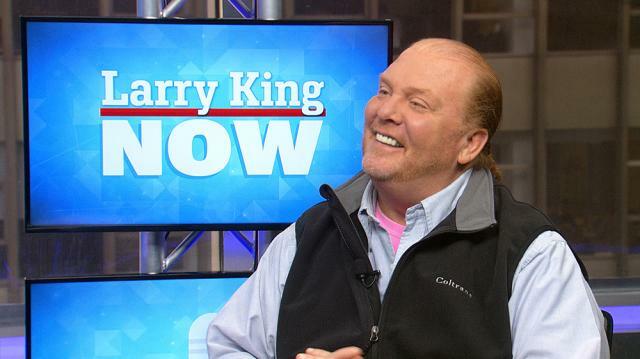 Mario Batali: Well when I opened my first restaurant, it occurred to me that the best way to be able to empower people and to grow was to stay with them and work with them. But I never really ever intended to open a second restaurant. The only reason I’ve opened subsequent restaurants is because my number two chef or my number two manager or my number two wine professional became so good that they were either going to work with me some other way, or they were going to go work for somebody else. So almost all of our next restaurants were a defensive move to keep the people we had trained so well to stay with us. So they became our partners. So at this point I have 26 chef-partners, 26 general manager-partners, and 26 wine director-partners, all of whom have trained with me for a long time, and because of that, they’re intuitive. We speak the same language, we can even talk just by winking our eyes.